It took eight years of planning, nearly $5 million and countless hours of paperwork, but the small town of Emery, S.D. finally has new asphalt streets. Residents of Emery – a Hanson County town of about 450 people and home to a crucial grain elevator – endured failing streets for decades, then drove on gravel roads for a year and will now pay a $20-per-month surcharge on their utility bills for the next 20 years to have smooth local streets atop upgraded sewer and water lines. All cities and counties in South Dakota struggle to keep up with roads that wear down over time and suffer potholes and degradation due to rainfall and the annual freeze and thaw process. But with a low property tax base, limited sales tax revenues and few options for government grants, small towns in South Dakota face big obstacles to installing and maintaining quality local roads. Small-town governments may also be more susceptible to complaints and grumbling from taxpayers, many of whom are their neighbors and either want better streets or cannot afford to pay more taxes. The concerns over allowing local roads to deteriorate range from letting small problems grow into big, more expensive problems to putting a community’s growth and economic development at risk. 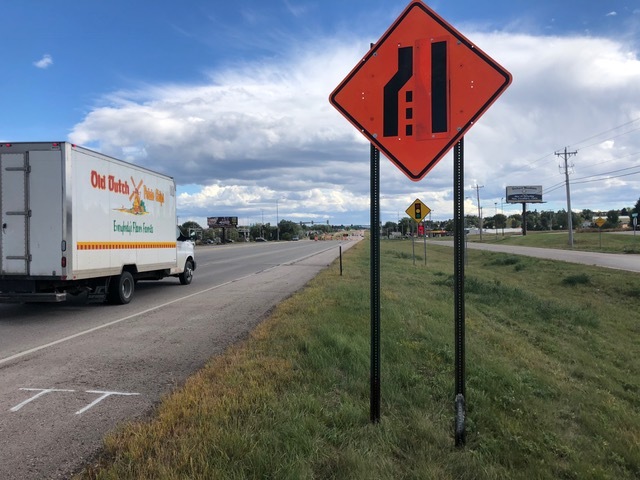 In general, the road repair process in South Dakota is based on which government entity has control over a specific roadway. Though there are exceptions and some creative funding mechanisms that comingle funds from federal, state and local sources, U.S. highways and interstates are maintained and fixed by the federal government, state highways by the state, county roads by counties and local streets by municipalities. For example, state Highway 73 is maintained by the state even as it passes through the boundaries of Lemmon. As it passed through town, U.S. Highway 12 is the federal government’s responsibility in Lemmon. When the two highways join and head east through town, the state and federal governments share maintenance costs until Highway 73 reaches its endpoint. 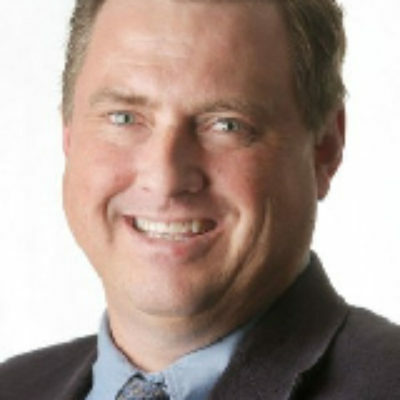 The federal government makes an annual payment to the states, which then re-allocates those funds to their own government and also to counties and cities, said Doug Kinniburgh, local government assistance specialist for the South Dakota Department of Transportation. Nearly $500 million is spent on transportation projects in South Dakota each year, according to the 5-year State Transportation Improvement Program that was updated this year. Projected spending for fiscal 2018 on improvements to highways, roads and bridges was $481.9 million, with the federal government allocating $370.8 million, the state spending $94.3 million and cities and counties paying about $16.8 million. The estimated overall spending is $484.9 million for 2019, $447.5 million in 2020, and $446.8 million in 2021. The 2015 South Dakota highway bill changed the way counties and cities receive their money and though most now receive a slightly lower state match, the change gave them more flexibility to fix whichever roads they choose and ultimately saved municipalities money, Kinniburgh said. That measure also created the state Bridge Improvement Grant Program, which helps cities and counties pay for bridge repairs. That program provides an annual allocation of about $15 million for qualifying projects that upgrade bridges, with 80 percent of projects paid by the federal government and 20 percent by counties. The state has one other way to aid cities and counties but only if they are working on infrastructure related to a significant economic development project. As part of the Building South Dakota legislation passed in 2013, the Governor’s Office of Economic Development was given $30 million for 2015-17 to award matching grants up to $500,000 to local governments for sewer, water and road projects that aid a business that generates tax revenues and jobs. The fund, which now also receives contractor excise tax revenues, has a balance of $2.87 million for fiscal 2019, said Cassie Stoeser, finance director for the GOED. Recent examples of projects aided by the program include a Brown County project to facilitate the expansion of AGP Soybean plant, an infrastructure project in Beresford connected to the Hybrid Turkeys hatchery, and a project to improve infrastructure related to VRC Metals in Box Elder. "If you come to town and your impression is, 'Boy, this town has a lot of street problems,' you think maybe they've got a lot of other problems too," Al Cerny, administrator and finance officer in Gregory, S.D. 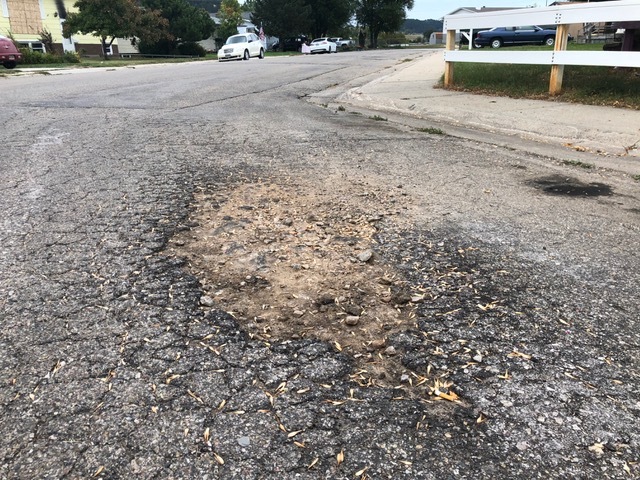 Balancing the need for street repairs against other priorities is challenging for cities with limited financial resources, said Al Cerny, administrator and finance officer in Gregory, a city of about 1,300 people in south-central South Dakota. Gregory spends about $80,000 to $100,000 a year on streets, nearly 10 percent of the city’s $1.1 million overall annual budget, Cerny said. That level of expenditure doesn’t cover all the needs, but helps the city maintain a positive image to locals as well as visitors or businesses that may want to relocate there. Small towns simply do not have the money to replace or repair all the local streets that need work or to build new streets to accommodate growth, said Sam Sorensen, mayor of Freeman, a city of about 1,300 people in Hutchinson County. Not only is funding limited, but small cities and towns must also figure in the cost to bring roads laid out and built decades ago up to modern standards for water drainage. Sorensen said he has opposed redoing streets in Freeman until ditches that keep damaging rainwater and snowmelt off roads are improved first. Sorensen said many small towns also pay to install water, sewer and streets for new housing developments that in larger cities would be paid for by developers who then pass those costs on to buyers of homes or lots. If the city lags too far behind in street maintenance, officials such as Sorensen will surely hear about it. Some South Dakota small towns are willing to let local roads remain gravel, which is much cheaper to maintain than paved streets but can also kick up dust and rocks that damage vehicles. Kinneburgh, the DOT local road specialist, said low oil prices in the 1980s sent many small-town governments on a road-paving spree because oil is a key component of asphalt. Kinneburgh said he wonders if some of those towns now regret paving so many local streets. The cost of materials to pave two lanes of a local street with 2-inch asphalt overlay is about $186,000 per mile, Kinneburgh said, a cost that has risen significantly in recent years. Once a street is paved, residents will come to expect that it will be properly maintained, he said. One common practice that keeps costs down is to apply a layer of what is known as chip-seal coating on roads to give them a surface that lasts about two years. New asphalt roads typically hold up well for seven to nine years. The city of New Underwood in central Pennington County uses a street surfacing process that is common in small towns that do not have the money to rebuild streets every decade or so. The city of about 700 people budgets money each year to pay for resealing half its local streets, then does the other half in the following year. Roads get a new seal on top but are not typically rebuilt with an entirely new surface. New Underwood saves money on its street sealing program by having city employees do all the work, even though it requires the help of a third employee who is not in the streets department each summer, Trullinger said. The city also lowers costs by buying all its chip-seal equipment used from other municipalities, he said. The chip-seal process adds a new layer to the surface of a local street, though the seal does begin to break down or begin chipping away in a year or two. When potholes form, the city uses a cold patching material made up of asphalt and oil to fill them in any weather. The street sealing program has kept costs low, with roughly $8,000 spent on materials each year. That does not include labor costs, but still limits road work spending to a small portion of the city’s $790,000 annual budget, Trullinger said. That year, the city bought and installed 200 tons of cold mix patching product to fill potholes, Anderson said. Nine years ago, the city council approved an aggressive and expensive plan to upgrade its streets which has cost about $4 million. In an average year, Anderson said, the city spends about $500,000 to pave or redo streets, roughly a third of its annual $1.6 million budget. The city paved about 36 blocks of gravel roads, and rather than laying a chip-seal surface to patch existing roads, Anderson began grinding and milling worn streets and replacing them with new asphalt. With a combination of political will, taxpayer dollars and ingenuity, Gettysburg has rebuilt its local streets and saved money along the way, Anderson said. The city spent $107,000 to buy its own street surface grinder, lowering the cost of milling and grinding from $10,000 a block by private contractors down to $1,400 a block when done by city employees. The ground up asphalt is then re-purposed as patching for alleys in the city, Anderson said. This summer, Gettysburg took advantage of one of the last remaining state Department of Transportation programs that provides grant assistance to small towns in need of road repairs. According to city Finance Officer Sheila Schatz, Gettysburg applied for and received a Community Access Program grant that paid 60 percent, or roughly $157,000, of a $262,000 project to repave streets leading to the local grain elevator. That program enables cities of under 5,000 people to get grants up to $600,000 to rebuild key roads such as their Main Street or roads leading to elevators or local schools. The recipient must pay for utilities, right-of-way acquisition and engineering costs, which for Gettysburg have been about $24,000 so far. The project enabled Gettysburg to replace five blocks of failed roads leading to the grain elevator with a new 16-inch base and 5-inch asphalt surface. Anderson said the shift from sealing to paving has resulted in quality road surfaces throughout Gettysburg, and also important for him, a dramatic reduction in pothole complaints from local residents.